I don't leave a lot of reviews... this movie in incredible. It is both an oral and visual history, given chronologically. The oral history is curated from veteran interviews conducted in the '60's. Obviously the visual history is from actual WWI footage. A word of caution to those slightly faint of heart... the visual history includes moments very graphic in nature - as that is the nature of war. It doesn't feel gratuitous - just a fact of. The stories were fascinating to hear. It is just so. well. done. Terrific interview with Peter Jackson follows the credits. This film really humanized WWI for me. I am in awe of how much detail and how modern this film made the war. I have never seen anything like it. This is a must see documentary! Powerful! 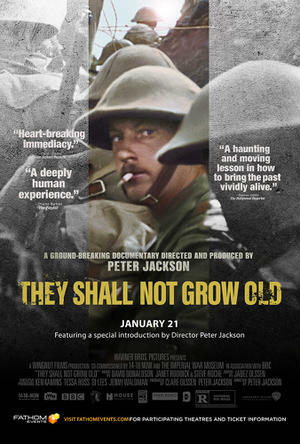 great documentary, commentary comes from soldiers on the Western front. amazing video restoration of 100 year old film.